The national championships are managed by the Mexico City lucha libre commission, but the city itself prohibited women's wrestling from the 50s until 1986. 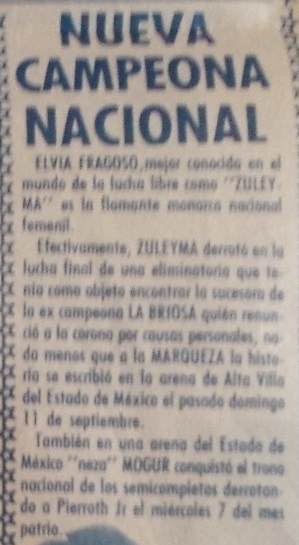 Women's wrestling was legal in other parts of Mexico, including Estado de Mexico right outside of Mexico City, but it's unclear if this championship was sanctioned similar to the other championships. There are many missing gaps and likely irregularities in reigns and title changes. Reyna Gallegos' title win in 1987 should be considered the modern starting point for this belt, and reigns after are confirmed. Lola Gonzalez has been credited in some sources as holding the championship in 1988 and defending it against La Marquesa on May 15, in Arena Naucalpan. Lady Apache held the championship nearly exclusively thru 2002 on, apart for a short run from Tiffany. Apache continued to be champion despite switching between AAA and CMLL (and back, and back) in 2005 and 2006, as the title is still officially controlled by the box y lucha commission. Apache won the CMLL World Women's Championship on Christmas Day, 2006, and held both titles for four months before deciding to give up the lesser national title. A 14 women cibernetico was held at Arena Mexico on April 27, 2006, with the final two survivors - ruda Princesa Sujei and tecnica Marcela meeting in a title match the next following week. - Irma Gonzalez  ? ? ? - Chabela Romero ? 1958? ? - Rosita Williams  ? 1959.??.?? ? - Irma Gonzalez  Chabela Romero 1959.??.?? ? - Rossy Moreno ? 1980.??.?? ? - Irma Gonzalez  ? ????.??.?? ? 6 Neftali ? 1991.??.?? ? ↑ via RB - earliest known defense, possibly the title change? ↑ Dark Angel is a Canadian, should not have been eligible! This page was last edited on 23 April 2019, at 13:28.